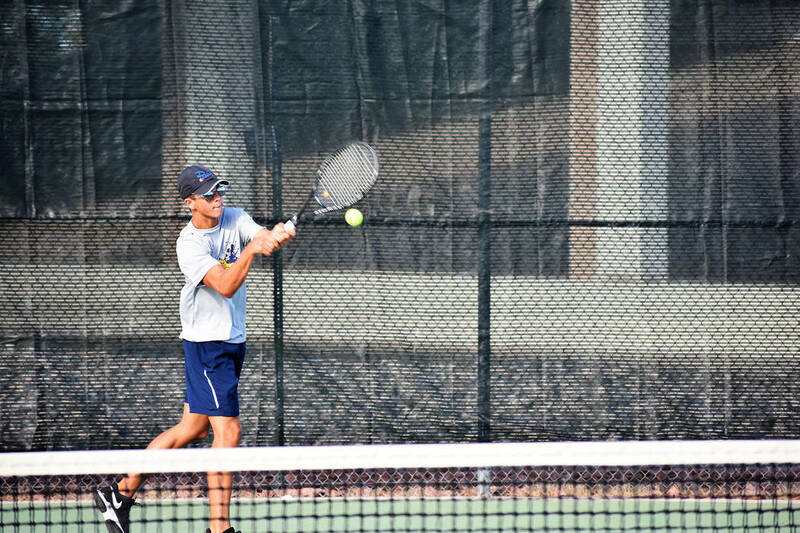 Cruising to a 20-0 record this season, Boulder City High School’s boys tennis team dominated postseason accolades, placing their entire starting core on either the first or second All-Southern Region team. Robert Vendettoli/Boulder City Review Boulder City High School senior Andre Pappas, seen earlier this year in a match against Desert Pines, recently received All-Southern Region First Team accolades for his efforts. Earning first-team honors, the Eagles placed all three singles competitors — senior Andre Pappas and sophomores Connor Mikkelson and Breton Erlanger — and their top doubles tandem of sophomores Boen Huxford and Preston Jorgensen. Mikkelson finished the 3A individual state tournament in third place, followed by Pappas in fourth. Failing to place, Erlanger also garnered a state tournament berth. Earning a state tournament berth as well, Huxford and Jorgensen lost to eventual state champion runner-up Justin Finseth and Ben Goodman of The Meadows in the semifinals. Senior Tanner Montgomery, junior Karson Bailey, senior Clayton Pendleton and sophomore Ty Pendleton earned second-team honors, recognizing all three Eagles’ doubles tandems who helped the team on its way to the 3A state championship. Providing great play for the Lady Eagles this season, which finished as 3A state champion runners-up, were all three singles competitors, sophomores Olivia Mikkelson, Tegan Pappas and Olivia Goodfellow, who were named first-team All-Southern Region, along with junior hybrid Natalie Bowman, who split time between singles and doubles this season. Highlighting the girls’ individual performance, Mikkelson established herself as the top singles competitor in the 3A after winning the individual state title. Earning second-team region honors were sophomore doubles competitors Olivia Leavitt and Katelyn Fox.